What a title! This cake deserves every descriptive word in that title, and it was the perfect cake to celebrate my sweet boy’s first birthday. 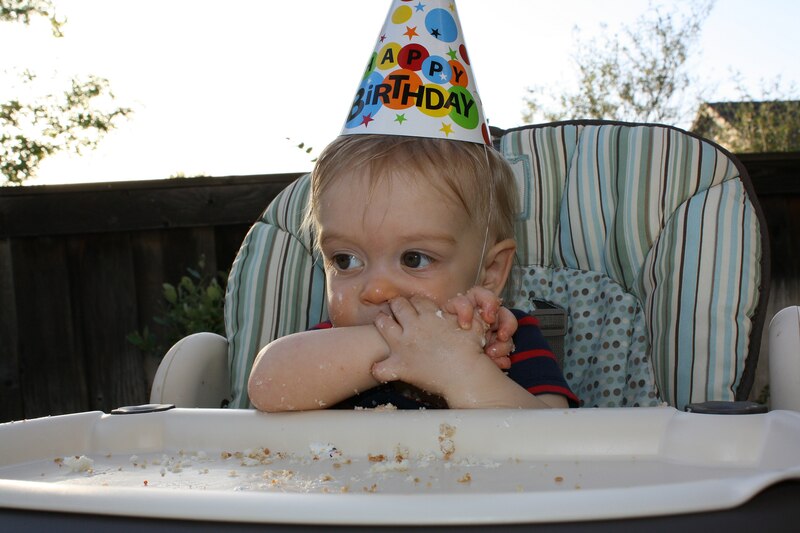 A few weeks ago William turned one, and we celebrated with a relaxed party at home with family and a few close friends. I thought and thought about a party theme, and nothing seemed quite right, until I settled on a color theme. I kept things simple, with a few colorful decorations and an easy menu of burgers and salads. And of course, cake! This fluffy vanilla cake is the perfect birthday cake. The cake is incredibly light and fluffy, and the frosting is sweet and studded with flavorful flecks of vanilla bean. I doubled the cake recipe and was able to make a 2-layer, 8-inch cake, a smaller smash cake for William, plus 8 cupcakes with the leftover batter. I also doubled the frosting recipe, but would have had plenty had I only made one-and-a-half recipes. We had warm weather on party day, which was great for grilling and eating outside in the backyard. The menu included burgers, this pasta salad, fruit salad, and a green salad. After dinner William opened his gifts, although he was more interested in playing with his toys than opening presents. Big sister Julia did not mind because that meant she got to do lots of helping! 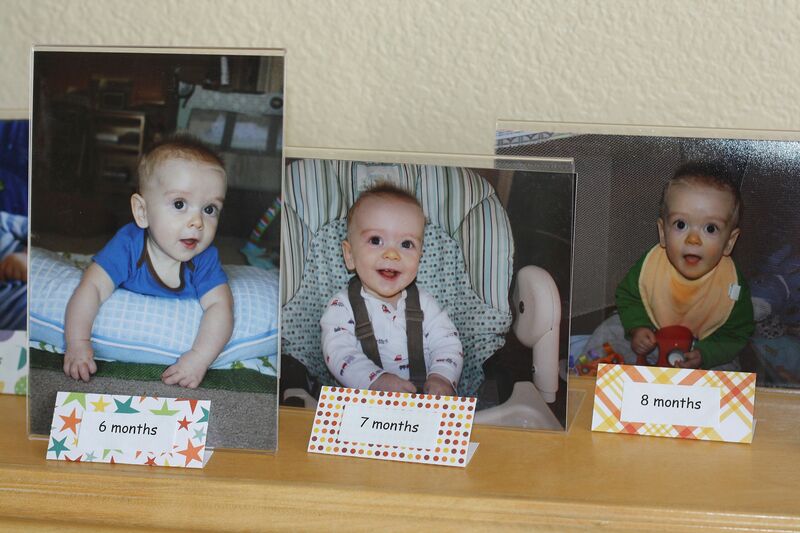 I printed out a photo of William from each month of his first year, starting with 2 days old and ending with a picture of him on the day of his first birthday. 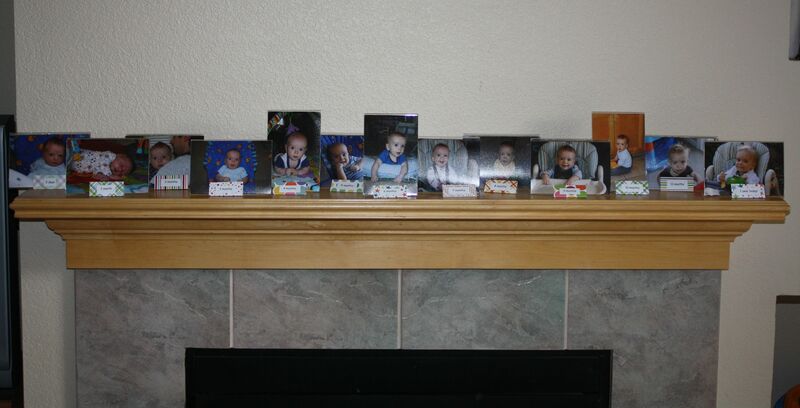 Our guests enjoyed looking at the photos of William from his first year. This was one of my favorite party decorations! I just loved how this colorful birthday banner turned out. I die-cut the letters out of red construction paper and cut squares out of cute patterned paper and solid color construction paper. I rounded the corners of the squares and then attached it all together with double-sided tape. I used mini clothespins to hang each piece of the sign to the ribbon- so easy! 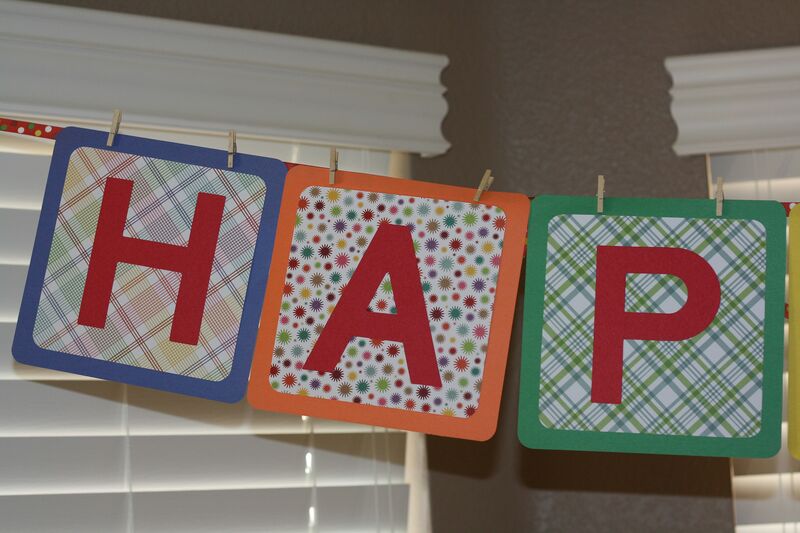 I highly recommend this method as I’ve used the mini clothespins for every birthday banner I’ve made now and they are cute and very easy to work with. 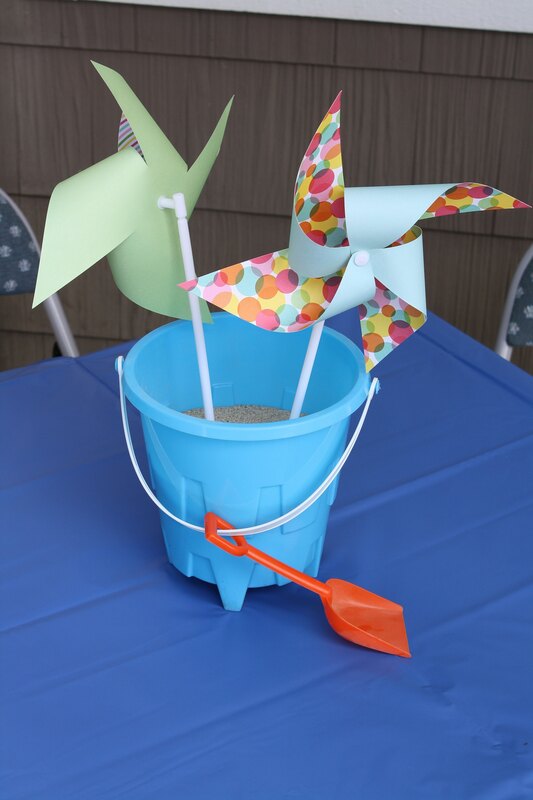 To decorate the tables outside, I filled colorful buckets with sand and then placed a few pinwheels in each. They were fun and festive! 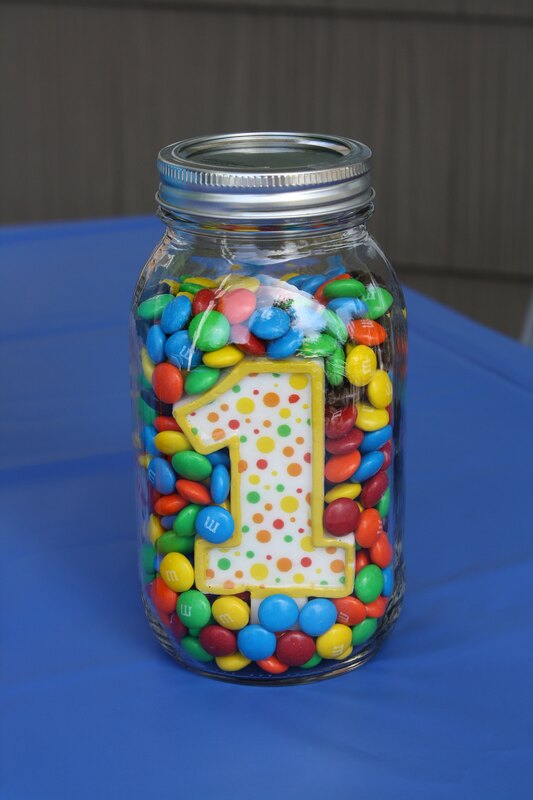 I also added color to the party with colorful balloons and mason jars filled with a first birthday candle and M&M’s. I found this cute idea on Pinterest. 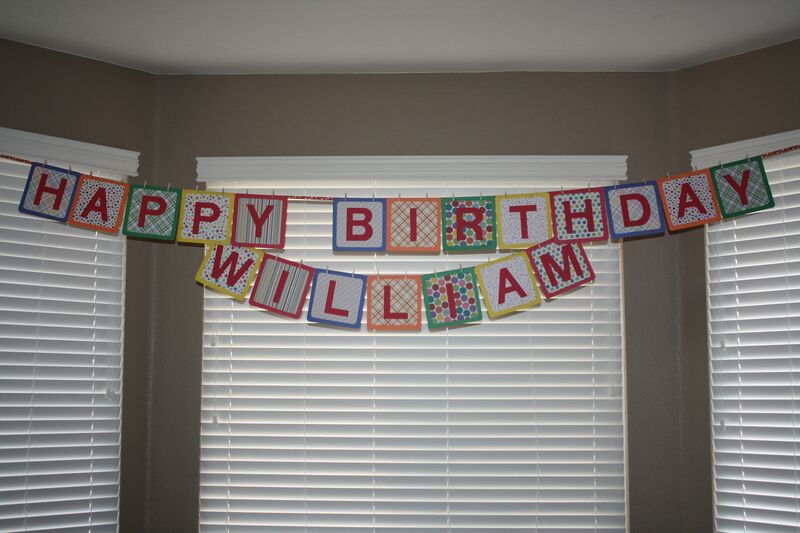 Happy Birthday, William! You are our little joy, full of so much personality and so many smiles. We love you! This is the perfect birthday cake. It's amazingly light and fluffy, and the whipped vanilla bean frosting is the stuff dreams are made of! Preheat oven to 350 degrees F. Butter two round 8-inch pans. Cut out two rounds of parchment paper the size of the pan bottoms. Line bottoms of pans with parchment, then butter again and dust evenly with flour. In a liquid measuring cup or medium bowl, whisk together the egg whites, whole egg, ¼ cup of the milk and the vanilla. Set aside. In the bowl of a stand mixer fitted with the paddle attachment, mix the dry ingredients together on low speed. Add the butter one piece at a time, about every 10 seconds. Continue to mix on low speed until the mixture is a fine crumbly texture. Add the remaining ¾ cup milk, and mix on low speed to combine. Increase the mixer to medium speed and mix for 2 minutes, scraping the side of the bowl as necessary. Add half of the egg mixture, beat on medium speed to combine, and then add the remaining egg mixture. Use a rubber spatula to make sure the batter at the bottom of the bowl is incorporated. Divide the batter between the two cake pans, spreading it evenly. Bake for 25-30 minutes. Cake is done when a tester inserted into the center has just a few moist crumbs attached. Let the cake cool in the pans for 15 minutes. Run a knife around the edge of the pans and transfer cakes to wire rack to cool completely before frosting. In the bowl of a stand mixer fitted with the paddle attachment, whip the butter for 8 minutes on medium speed. The butter will become very pale and creamy. Add the milk, vanilla bean seeds, vanilla extract, and salt and mix until combined. Add in the confectioners' sugar and mix on low speed for 1 minute, and then on medium speed for 6 minutes. The frosting will be very light, creamy, and fluffy and is best used right away. 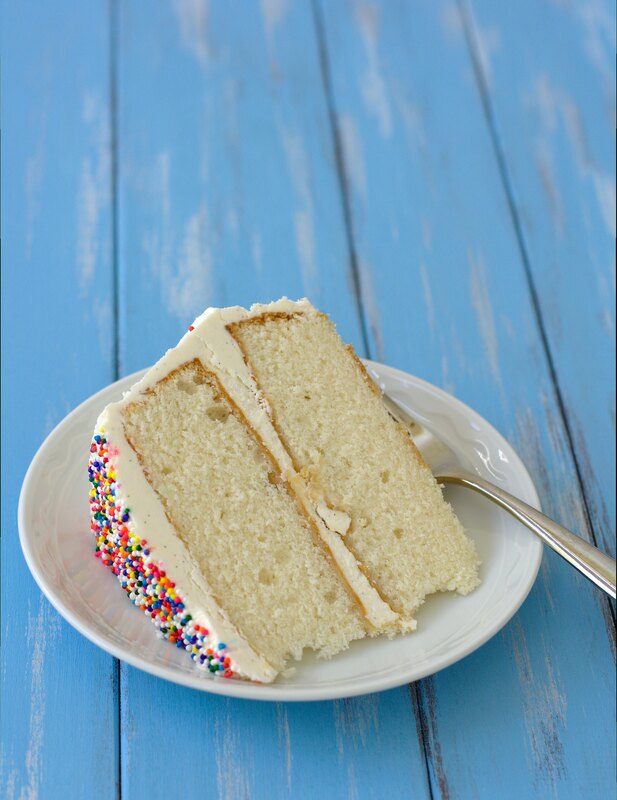 Place bottom cake layer on a cake plate and spread 1 cup of frosting on top with a small offset spatula. Gently place 2nd cake layer face down on top. Place a generous scoop of frosting on top, spreading evenly with a small offset spatula and working your way down the sides until you have a thin layer of frosting over the entire cake. Chill until set, about 30 minutes. Remove from refrigerator and apply a final “coat” of frosting. I highly recommend using a kitchen scale to measure the ingredients by weight. Also be sure to allow time to let the eggs and milk come to room temperature. Amazon.com is a great place to purchase inexpensive, high quality vanilla beans. What a cute party! I love the centerpieces. I am definitely going to try this recipe the next time I need to make a cake or cupcakes. Really interested in this cake, it looks so good!! How long did you bake in the smaller cake pan, for the smash cake, and how long did you bake the cupcakes? I really don’t want to mke a regular size cake, cupcakes are just so much easier to serve! Thanks! I honestly don’t remember how long I baked the smaller cake and cupcakes. For the smaller cake, it would depend on the size and shape of your cake pan. While my smash cake was smaller in diameter, it was taller, so I think it took almost as long as the large cake layers to bake. I would just start checking at about 20 minutes and go from there, testing with a toothpick. Cupcakes usually take about 18-20 minutes, and these should be the same. Good luck! That’s not a silly question at all! To make the 1 with sprinkles, I used parchment paper. I drew the 1 shape on the parchment and cut it out, being careful to leave the outline of the 1 in one piece as well. 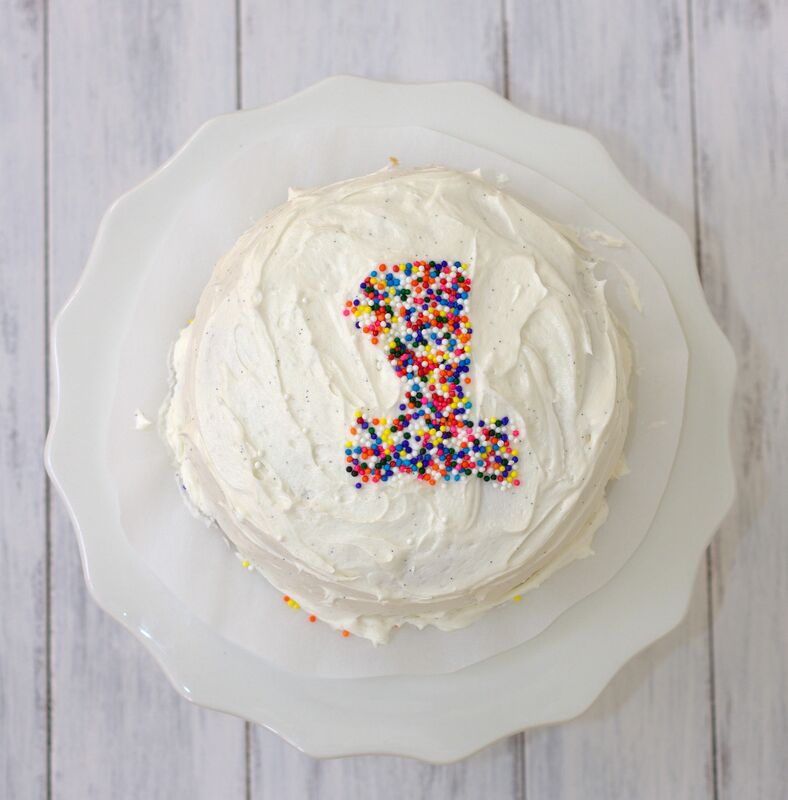 For the smash cake, I carefully laid the outline of the 1 down and filled the 1 in with sprinkles. I think I may have had a little help from my husband to hold it in place without pressing it into the cake too much. It worked fine, and it shouldn’t mess up the frosting as long as you are careful. Good luck! Loved your post! I just used the recipe for my baby girl’s first birthday – the cake is in the oven for our party tomorrow. It’s looking good so far. Fingers crossed it turns out as well as yours looks like it did! Happy Birthday to your little one! I hope your cake turns out perfect. I’ll be making this cake again next weekend for a family birthday celebration- it’s the best! Thanks for sharing the yummy cake recipe. I wanted to know how you recommend adapting your recipe for just the smash cake? I would like to make a smaller and taller version but am not sure how to adapt pan size, measurements, cooking time, etc! Any help is appreciated, thank you! It would depend on the size of the pan that you plan to use for your smash cake. I would probably just halve the recipe, and remember not to fill the cake pan more than about half way full as the cake will rise as it bakes. You will probably have some extra batter with half a recipe, but you can always make a few cupcakes. 🙂 Regarding baking time, see my above reply to Carla’s question. Just found this and it looks perfect. I’m not a cake maker, but wanted to give it a go for my little one’s first birthday. Want to get it right. To clarify… In recipe you say split mix between 2 tins, but I know you had excess mix and made extra cupcakes. How full/deep should mix be in 8″ tins? Filled to the top? Or guessing they rise… Sorry! I would only fill the tins half way full, as the cake will rise quite a bit while baking. I think you will love this cake – my family and I have made it a number of times and it’s always great! Happy first birthday to your little one! I am planning to make this cake for my sons birthday. But I’m not sure my grocery store has vanilla beans. If not, what should I do? Add more vanilla? I wouldn’t add more vanilla to the frosting. I think it would be delicious even without the vanilla bean. If you have time before your son’s birthday, you can order vanilla beans on Amazon. They are relatively inexpensive there. Happy Birthday to your son! Great idea! I do have time. Thanks so much! Looking forward to this cake!! One more question: I just made this and the parchment paper skewed the shape of the cakes….I obviously did something wrong. Any suggestions? Thanks! I’m so glad you enjoyed this cake! It is definitely a favorite of ours. I’ve updated the recipe with more specific instructions about the parchment. Enjoy your weekend! – How did you get the sponge cake to bake flat? Mine always rises at the center giving a dome shape. – Is this cake moist enough or should I sprinkle some fruit juice over it to moisten it? So looking forward to baking this tomorrow! Would appreciate your advice. Hi Jyotsna! Cakes often rise in the center when they bake. If I want/need it to be totally flat then I use a serrated knife to carefully cut off the top so that it’s flat. Do you know how to do a crumb coat with frosting to prevent crumbs in the outer layer of frosting? First spread a thin layer, let it set, and then add a final layer of frosting. This cake is perfectly moist as is; no fruit juice is needed. I think you are going to love this one! Thanks so much for the tip Kristine. As you probably guessed from the questions, I am a novice baker :). This will be my first icing cake. Will let you know how it goes! You made my day with your sweet comment! I’m so glad you enjoyed this cake. Happy birthday to your little girl! Kristine, After Icing the cake today does it have to be refrigerated? I will be using it tomorrow. Also have you ever tried putting Fondant decorations on the sides? If you are not serving the cake until tomorrow I would refrigerate it. It would most likely be ok without but I always err on the safe side! Be sure to take it out a few hours before serving to allow it to come to room temperature for best taste. I have never tried adding fondant decorations. Enjoy! Hi Kristine! The cake looks amazing and I’m going to make it tomorrow for my baby’s first birthday! Just wondered out of interest what the rationale is for the butter being cold, as I’ve always used room temp butter in vanilla sponges in the past. Yours looks amazing so it must do something good? Hi Sarah! I don’t have a good reason for using the cold butter, other than that’s how I’ve always made this cake and it is the best vanilla cake I’ve ever made. I’ve made it at least six times and it always turns out wonderfully. Happy first birthday to your little one! I’m excited to try this cake for my daughter’s first birthday next month. I have a couple of questions though – I live at 6500 feet, any suggestions for adjusting for altitude? Also, does the cake need to be kept refrigerated once the frosting is on? I hope your family enjoys this cake as much as mine does, Rosie! I recommend frosting the cake the day you plan to serve it. That way, no refrigeration is needed. (It should be fine left out for a few hours.) You can bake the layers the day before and wrap them tightly in plastic, if you want. I always refrigerate any leftover frosted cake. thank you, thank you, thank you! I’m not known for my baking prowess, but this cake was amazing. I loved your detailed directions on how long to mix things for. This cake was a huge hit even with the in-laws who are baking mad. Hi Jennifer, The bake time should be about the same, maybe just a few minutes shorter since the cakes are thinner. I hope you enjoy your cake! 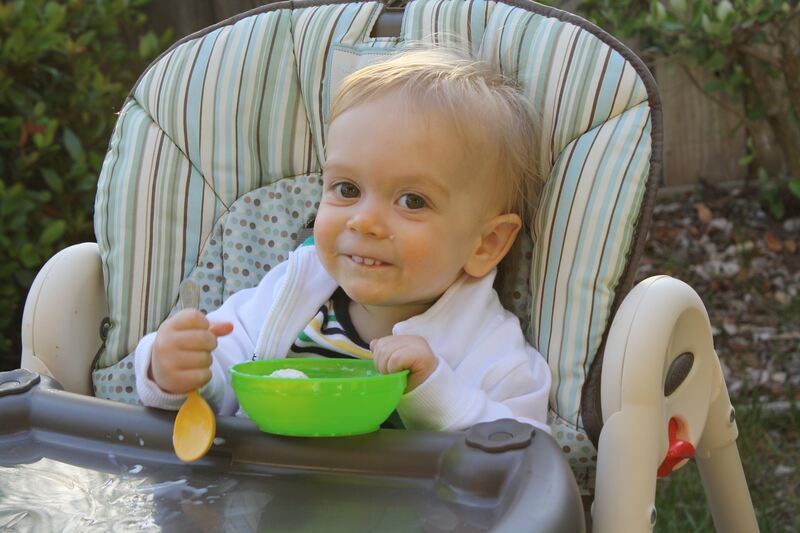 I’m planning to use your recipe to make my son’s first birthday smash cake. What size of pan did you use for the smash cake? Thanks! I think it was a 4-inch pan. I used two of them to make a double layer smash cake. I hope you like this recipe. It’s our favorite! Thanks for your reply! I have more questions as I’m not good at baking cakes, I hope you don’t mind! Did you decorate the cake with sprinkles right after you put the final icing or did you wait for the icing to set? Also I’m gonna use 5 inch pan, how many minutes should I bake the cake? Thank you so much in advance! I’m not sure exactly how long it will take to bake in 5 inch pans. I’d guess between 20 and 25 minutes, but you’ll just want to check it often. It’s done when a toothpick inserted into the center of the cake comes out with just a few crumbs attached. I have a great teacher ☺ Thanks again for answering my questions! Thank you for this delicious recipe! I made it today for my son’s first birthday. I didn’t plan ahead enough so I didn’t have a vanilla bean, but the frosting still turned out amazingly. I made all cupcakes, and had batter for 12 regular sized cupcakes and 24 mini cupcakes, plus had a little batter left over. I used colorful poka dot cupcake papers. I piped on the frosting with an easy accent decorator and added colorful sprinkles. They looked and tasted wonderful! This recipe is a keeper, thank you!! Thank you, Kathryn! I am so excited to hear that you loved this cake! It is our all-time favorite vanilla cake. 🙂 Happy birthday to your son! Hi I love this cake and wondered how many it fed roughy? Thank you, Jade! I’d say it serves about 10. Enjoy! I really hate to leave bad reviews but I made this cake exactly as the recipe suggests and its so, so bad. Quite disappointed, needed a cake for my niece’s birthday tomorrow but I’ve no time to make another now. What a waste. It was bland, did not bake well, puffed up in the middle and left an inverted crater from the bottom. Stuck a toothpick in at 30 mins and it came out clean but it wasn’t even baked. I’m so sorry to hear that, Yas. I’ve made this cake at least 10 times, and I have friends and family who have made it a number of times as well. It always turns out and is full of vanilla flavor. Did you do anything to modify the recipe? would i be able to split the batter between 3 – 8 inch pans instead of 2? The cake layers would be pretty thin if you did that, and you would need to reduce the baking time and watch them carefully. I made this cake for my daughter’s first birthday last week. It came out PERFECT. Its the best cake ever. the texture is rich and not light and crumbly like boxed cakes. This recipe is going in my heavy rotation folder. Your party theme was great too. So simple! I’m so happy to hear that you liked this cake, Sandy! I agree, it is the best! I can’t even tell you how many times we’ve made it- it’s my family’s go-to recipe whenever we need a vanilla cake. Happy birthday to your little girl! Made this for my daughters first bday. Doubled the recipe so that i had a smash cake plus muffins to give to friends at daycare etc. It was fantastic! I didnt do any modifications. Just didn’t use parchment paper in pans bc i use teflon pans. This is my new go-to cake recipe! Happy birthday to your little girl! I’m so happy that you liked this recipe. It’s my go-to vanilla cake, too! Hi Sharon, basically, you want the parchment to cover the part of the cake where you want no sprinkles. 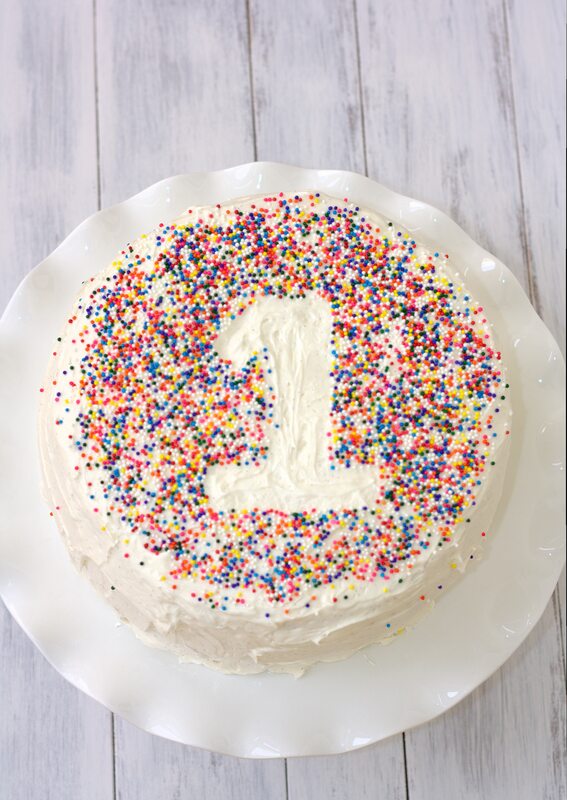 So if you want an empty “1,” you’ll cut out a 1 with parchment and lay it on the cake, then put sprinkles around. Remove the parchment 1 and that’s it!